Take Action! Preserve Access To Stem Cell Therapy In The U.S.
UPDATE: Thank everyone for submitting 381 comments! We will keep you posted on the outcome. The public has the opportunity until Dec 22, 2014 to present comments to the FDA regarding regulation of adult stem cells. You can jump to the TAKE ACTION INSTRUCTIONS below, but here’s the situation. Patients For Stem Cells opposes this draft exemption in its current form because it further limits access to use of autologous (your own) stem cells to treat illness and injury. Many of our members have found cellular medicine to be safe and effective. Further government restrictions are not needed. The History: Over the past decade, many things that were previously defined as the practice of medicine in cell based regulations have been moved from physician to FDA control. These have included cell culture and the bedside processing of fat tissue. Now centrifugation could be the next physician right to fall under FDA regulation. This last problem is part of a new FDA draft guidance. The Issue: Larger and larger numbers of physicians are using platelet rich plasma (PRP), bone marrow concentrates (BMC) or adipose derived Stromal Vascular Fraction (SVF) in their medical practices. These are usually prepared by an automated bedside centrifuge at the point of care (POC). The physician’s ability to process cells in this way has been allowed by FDA through an exemption in its cell based therapy regulations codified in 21 CFR 1271.15(b). This exemption has been narrowed most recently in 2006 to allow simple processing steps like centrifugation, but to exclude culturing or more extensive processing of cells. The draft guidance in question now seeks to narrow this exemption further to manual tissue preparation during the same surgical procedure (i.e. the cutting, shaping, or washing of whole tissue). Curiously exempt from the draft guidance is centrifugation, despite numerous 510K cleared devices in existence that use this technique to isolate platelets from blood or concentrate the stem cells in bone marrow. If the guidance is adopted, the big picture implication is that any physician using centrifugation to process cells at the bedside and part of the same surgical procedure, could be regulated not by his or her state medical board, but also by the FDA. This would mean dramatically increased costs for physicians who would need to register with FDA, to hire expensive consultants to produce tissue processing quality systems, and to employ consultants or other employees to keep the physician’s office up to the standards that the FDA sets for the wholesale processing of tissue. The practical implication of this guidance is therefore that few physicians will spend the time, money, and employee resources to be compliant, either causing them to avoid these simple and helpful therapies or leaving them open to enforcement actions by the FDA. What can you do now? The FDA has asked for comments on the guidance. They normally receive a few scattered letters from physicians on these issues, but we have the opportunity to make our voices heard on a massive scale. Be sure to share this post! Here’s how you can tell the FDA and your representatives what this means to patients, and their doctors. 1. Comment:, see examples below, which you can copy/paste. Or you can just enter ” I oppose this draft exemption in its current form “. Click HERE once you have your comment ready. Paste it in the Comment box (opens in a new tab so you can come back to these instructions). Do NOT select “Individual Consumer”, or your comments will not show up publicly. copy your comment so you can also send to your Representative (step 5. below). 5. Find your Representative and email them the comment you copied, and a link to this post so they can get the background. It may take a few days for your comment to get reviewed and posted at the Federal Register. You can read the comments here. We will also send out an update on the outcome. I oppose the draft exemption in its current form. As a patient, the access to my body’s own tissue is a serious concern. FDA’s new draft guidance would further limit what my physician can do to help heal or treat my condition. Forcing physicians out of inexpensive autologous cellular medicine (that uses my own cells to help heal or mitigate my disease) and into expensive tissues purchased from a tissue bank or a drug company will limit and not expand access to this type of medical care. I oppose the draft exemption in its current form. As a physician who uses centrifugation to process autologous cells at the bedside, I am concerned that your recent draft guidance doesn’t explicitly state that physicians can use this technique to help isolate their patient’s cells at the bedside. This will impede my ability to cost effectively treat my patients by forcing me to either register with FDA as a tissue processor or to purchase much more expensive and potentially more side effect laden cellular drugs and or allogeneic tissues. I oppose the draft exemption in its current form. Platelet rich plasma and bone marrow concentrates are a key feature of my practice that I have used to help patients recover from orthopedic injuries. Further limiting access to these autologous therapies by not explicitly stating that centrifugation is allowed under 21 CFR 1271.15(b), will force me out of using this type of care for my patients. As a small medical practice, I cannot afford to spend the hundreds of thousands of dollars that registration and compliance with FDA 361 tissue processing guidelines will require. I oppose the draft exemption in its current form. Autologous biologics are key to promoting the inexpensive physician led innovation that will help contain the future costs of musculoskeletal care. By not explicitly listing centrifugation and other parts of the minimal manipulation guidelines outlined in 1271, the FDA is reducing physician access to these inexpensive technologies. I oppose the draft exemption in its current form. Centrifugation is a technology that has been used for a century by physicians, but is not included under the draft same surgical procedure exemption. There are no safety issues that have been identified with the use of centrifugation by properly equipped labs or through closed systems. 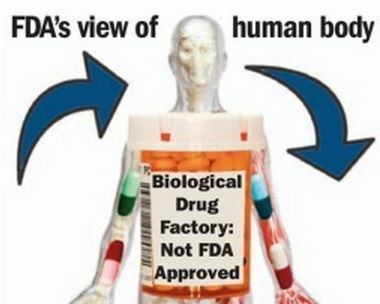 The FDA’s own statements in its early document entitled “Proposed Approach to Regulation of Cellular and Tissue-Based Products” are “[t]he agency would not assert any regulatory control over cells or tissues that are removed form a patient and transplanted back into that patient during a single surgical procedure. The communicable disease risks, as well as the safety and effectiveness risks, would generally be no different than those typically associated with surgery.” It’s unclear how the patient safety profile of centrifugation has changed since the late 1990s. Text of the FDA draft guidance Docket # FDA-2013-D-0446 Same Surgical Procedure Exception Questions and Answers Regarding the Scope of the Exception; Draft Guidance for Industry; Availability. This entry was posted in Take Action and tagged fda reform, stem cell therapy on 11/21/2014 by patients.